The Tuneblocks arrive: The TuneBlock SE feet arrived in a standard shipping container. Inside was a labeled cardboard product box containing the TuneBlock bases which were wrapped in sheet foam. Nestled in the foam was a separate labeled Ziploc bag containing the tungsten carbide bearings. Simple and efficient. I prepared the system and selected a few recordings. The subwoofer was employed in order to test for any low-frequency acoustical breakthroughs. Cut 1 “El Choclo” from Sera una Noche La Segunda [M.A recordings M062A]. A superb minimalist, high sampling rate recording in a cavernous acoustic space. Warmth, delicacy, natural instrumental timbre and an energetic interplay of percussion, clarinet and guitar. Cut 3 “Cuando Silba el Viento” from the same recording. An intoxicating female vocal with instrumental accompaniment in a warm, huge acoustic. Delicate with wide, unforced dynamics. Cut 2 “Howell‘s Delight” from Best of Baltimore Consort [DOR-90023]. A beautifully miked recording which has unforced dynamics, natural vocals and a huge acoustical space. Cut 1 “Theme from the Pink Panther” on Mancini’s Greatest Hits [Telarc 51572W] A familiar piece of music with wide dynamics, superb high frequency detail especially on the triangle and a well defined brass section awash in hall acoustic. Excellent placement of instruments including the famous saxophone. A better example of Telarc recordings. Cut 1 “Tra la Fiamme” of Händel: The Italian Years [DorianDOR-90147]. Subtle interplay. Upper octave air and hall acoustic. Unforced wide dynamic range on Julianne Baird’s vocals. Cut 3 “The Battle” from the soundtrack of Gladiator [Decca 289 467 094-2]. Dynamic piece with powerful bass lines contrasted against subtle orchestral play and detail. Massive drums. Soaring strings and a delicate guitar. It challenges the ability to preserve fine cues and not overload and smear information. Cut 14 “Habanera Fantasia” from This is K2 HD Sound [FIM K2 HD 078]. Hall acoustic. Bell transient reverberation and decay. Castanets. Distinctive sharp attack with the character of the wooden body. If the timbre and leading edge are handled wrong, you lose the wood. Cut 16 “Pachelbel/ Canon in D” from the same CD. An unusual percussion interpretation of the music which challenges a system’s ability to retain the character of the instruments and their natural attack and decay. Excellent soundstaging and dynamics. Cut 13 Disc 2 “Lost in Space” from the CD The Science Fiction Album [Silva Screen Records FILMXCD359]. Remarkable duel between the string and brass section with extremely rapid stops and starts. Power and delicacy in the interplay. Precise work by the Prague Philharmonic and clean recording work by Smecky Studios. Cut 5 and 6 “Suite fur Orchester Nr. 2” by J.S. Bach from Highlights CD4 Collegium Aureum [Stereoplay 697 002]. A single point stereo microphone recording. Also includes a diagram of the angles and distances each instrument was in relation to the microphone. Perfect for evaluating reproduction of instrument placement. Subtle instrumental interplay between flute, violin and harpsichord with excellent differentiation of distinct instrumental characters. Cut 9 “Brilliant Mind Furniture” Hardest Hits 4 [SPG004] An ambitious piece of 80’s pop music with a complex mix of electronic and acoustical instruments which challenges the ability to differentiate hard and soft leading edges. Offers large acoustical space and good placement. Surprisingly dynamic and highly detailed on the soft end of the spectrum. 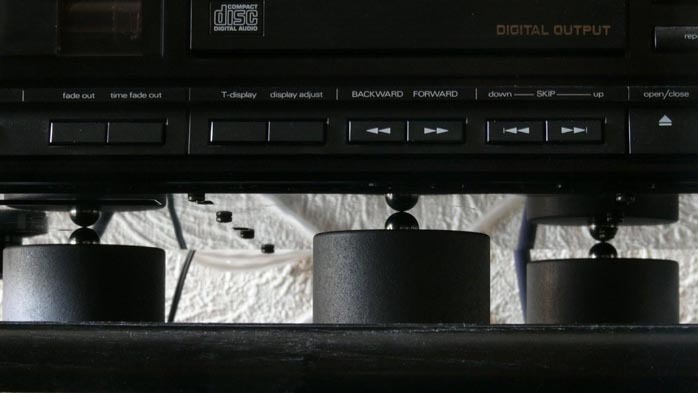 22-pound CD player could slide easily and cable dressing became important. From the first moment the strengths of the TuneBlock SE were apparent. Tremendous midrange clarity. Fast attack and release. Separation of vocal lines. Placement. Focus. Low noise floor. Wide dynamics and gradations. An obvious lowering of distortion. A removal of false resonance-based information that had been riding on the actual signal. There was a wonderful bubble of coherent information through the midrange and upper mids which was breathtaking and convincing. Orchestral and vocals lines were easily separated and dynamic inflection was preserved extremely well, especially through the critical midrange area. Instrument placement and their relationship to the hall acoustic were obvious. Image size and localization were pin point when occurring in the recording. Depth perspective was extraordinary due to the lowered distortion. The resolution level was high, capturing long decay information extremely well and instrumental nuance in a natural fashion. Complex mixes were easy to follow, making delicate interplay between instruments engaging and simplifying complex orchestral sweeps into human proportions. High order articulation. The TuneBlock SE was revealing itself to be a formidable isolation component. Its bubble of coherence in the mid to upper midrange was a major strength but were there any weaknesses? There was a mild rise in the extreme upper midrange but I would describe it on the same level as the response lift of a moving coil cartridge. The penalty is a little extra high-frequency air. For a large portion of the listening audience, that description will actually mark a strong suit for this product. Below that bubble of coherence was also a mild reduction in level in the upper bass range, a small dip in amplitude in a fairly narrow band in comparison to the frequencies around it. Nothing drastic and the performance in that band retained tremendous articulation and detail with no loss of dynamic ability. It merely created a spotlighting effect in the band above where the product performed at strength. The penalty for this deviation was a tiny reduction of body and the accompanying dimensionality that occurs in that range. For example if we listen to an acoustic guitar, there is both the sound of the strings and also the body of the guitar. A dip in that range will emphasize the string over the body. The sound will be exceptionally clean but also a little lean. I emphasize that the effect was small and in no way overshadowed the overall performance strengths. Some would explain it as the direct result of the lowered distortion level and would look upon it as a strength. At this point I felt that I had a good perspective on the product’s performance and proceeded to try the feet under the amplifier. The next portion of the review took an interesting turn and it would eventually lead me back to a second session under the CD player.